Find out how you can optimize your pelleting process with the new generation Van Aarsen pellet mills with motor-operated roller adjustment and active roller slip control. These functionalities provide you optimized operation and the opportunity to experiment with the roller distance and steam addition for the recipes to boost feed quality and production efficiency. The key of an efficient pelleting process is to determine the optimal compromise between energy consumption and pellet quality, while producing the desired capacity. 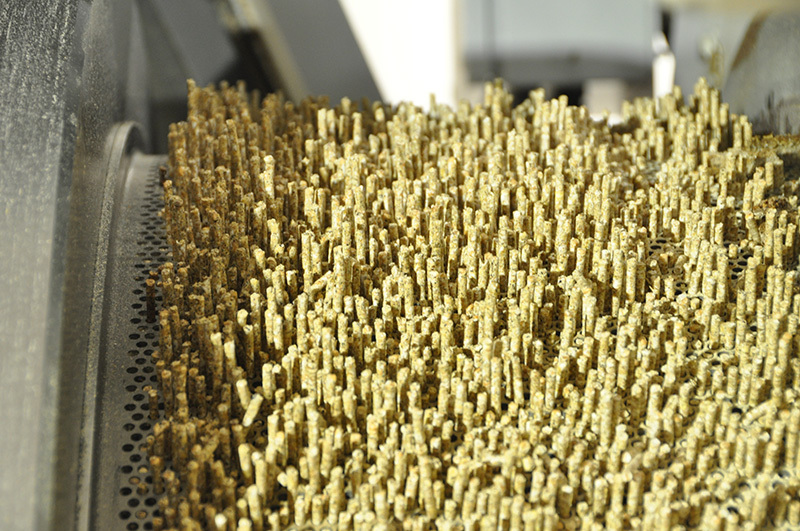 The pelleting process is influenced by many factors, from steam addition to pellet mill settings and motor load. By adding more steam, gelatinization is improved and the meal can be pelleted better. 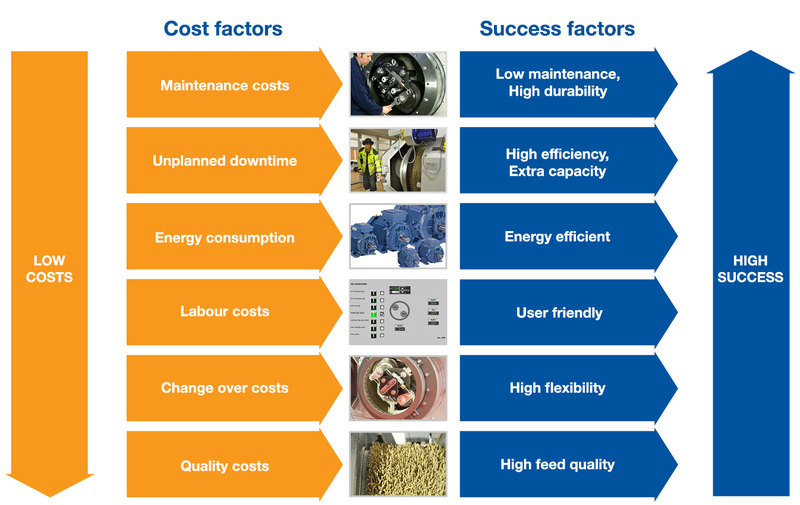 This results in a higher capacity, improved quality and less energy consumption. There is a limit to the quantity of steam that can be added as too much steam addition can cause roller slip and lead to downtime by the mill becoming blocked. The motor-operated roller adjustment enables the operator to easily choose the desired roller distance to the die, even when the pellet mill is in full operation. This system offers precise and recipe controlled roller gap settings enabling you to optimize the pellet quality. This system detects roller slip and activates the system to automatically resolve the slip if desired, reducing the downtime of the pellet mill caused by roller slip to nil.It also offers you the opportunity to experiment with the roller distance and steam addition for the recipes to boost feed quality and production efficiency. You can rely on this system while exploring the settings for the most optimum production. Another benefit is the increased life expectancy of the die and rollers up to 30%. By linking the operation of the dosing screw to the roller distance, the rollers will retract when the pellet mill is not producing. 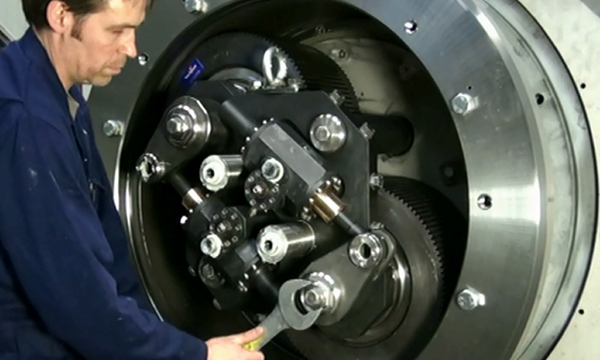 The system is equipped with a die-cleaning mode, enabling the operator to clean the die after a batch. This will also provide a quick start-up of the pellet mill after a standstill, because the product doesn’t get the opportunity to “cake” to the die. All critical components are treated with an easy-to-clean coating. The acquisition costs of a machine are just half the truth. The operating costs (maintenance costs, unplanned downtime, change-over costs, energy costs, quality costs, etc.) determine the real investment in your machine. The extra investment of a new CU Dynamic pellet mill compared to a CU Basic pellet mill has a short payback time. Even less than 1 year is realistic. When you are not looking for a new pellet mill but are interested in the additional benefits of the CU Dynamic, it is also possible to upgrade your existing Van Aarsen C-type pellet mill to this new standard. An upgrade is recommended when the current die holder should be replaced, saving revision costs. By answering a few questions about your personal situation we can quickly calculate the payback time for you. Less wear and tear – easy adjustment of the roller lever and changing of the rollers – die cleaning mode – easy to clean coating.